Overview : With the PLAYSTATION®3 memory card adaptor, game save information from PlayStation® and PlayStation®2 Memory Cards can now be transferred onto the PLAYSTATION®3 hard-disk drive. This allows players to access all of their old games without starting over, keep earned scores and items, and continue where they left off on their PlayStation® and PlayStation®2 games. Quality/Usability : When the PlayStation 3 launched, it had backwards compatibility thanks to the 20GB and 60GB. Of course, everyone wanted to try out the backwards compatibility whether it be PS1 or PS2 games. But how can we continue from where we left off without having to start all over? 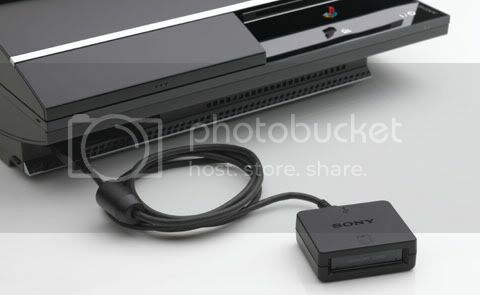 Sony has released an adapter that lets you insert your original PlayStation and PlayStation 2 memory cards into the PlayStation 3 using a little USB Memory Card Adapter. With this adapter, you no longer have to start from scratch. The adapter consists of a small black box that measures approximately 2.25" x 2" x 0.75". On one end, is one slot where the memory card goes into and on the other end is where you connect the USB cord. Unfortunately, no USB cord is included so you'll have to use the USB cord that came with your PlayStation 3. Once the adapter and memory card is connected to the PlayStation 3, the memory card shows up under Game section of the XMB and you'll find a Memory Card Utility. When you press "X", a message will pop up telling you that the selected memory card will copy to the hard drive and do you want to continue?. Choosing "YES" will prompt you to give the internal memory card a name. It will then copy over your game saves. Copying of game saves takes a couple of seconds to a couple of minutes depending how many saves you have on your PS1 and PS2 memory card. As of version 1.80 firmware, you can copy saved data from PlayStation or PlayStation 2 format software stored on their PS3 system to a Memory Card (15 blocks) or Memory Card (8MB) (for PlayStation 2), using your PS3 system and a Memory Card Adapter. The adapter will not work with cards that have more than 8MB (PS2) or 15 blocks (PS1) of storage space. So if you have a 3rd party manufacturer memory card such as HORI or MadCatz, that has more storage space than Sony's, you wont be able to copy them over. Conclusion : Overall, the PS3 Memory Card Adapter is great for those who own a backwards compatible PlayStation 3 such as the 20GB, 60GB and 80GB and want to transfer their game saves from the PS1 or PS2 memory card to the PS3. No USB cable is included, so you'll have to use the USB cable that came with the PlayStation 3. You're unable to use any memory cards that are bigger than 8MB or 15 blocks. So you'll have to go and purchase a PS2 memory card or borrow someones card in order for you to transfer from your 3rd party card to the Official Sony card to the PS3 via the adapter. As of version 1.80 firmware on the PS3, you're able to copy saves from PS3 to memory card. But I see this adapter not being used often.